1. LILLEBaby Complete All Seasons Baby Carrier. This is a truly excellent carrier, and this is the second year the LILLEBaby carrier was tested for inclusion in our list, and it made it right into the first place position again! The LILLE Baby series is relatively new to the baby carrier market, using beautiful and highly functional Scandinavian styling, and including some very comprehensive features. They make three categories of carriers: the LilleBaby's COMPLETE series, CARRY-ON series, and ESSENTIALS series. As the name would suggest, the COMPLETE series is the most versatile, with six carry positions, a wide weight range that includes infants down to 7 pounds, and big kids up to 45 pounds. Within the COMPLETE series, they have the All Seasons, the Airflow, the Original, and the Embossed Luxe version. Unless you live in (and never travel outside of) Arizona, southern California, or Florida, which might lead you to purchase the Airflow version, we highly recommend the All Seasons. The All Seasons version uses a cotton exterior fabric, a highly breathable 3D cool air mesh lining, and has an awesome zip-down front section for warmer conditions. This was an awesome touch because many of our moms reported that there are very few single carriers that are versatile enough to adapt to different weather conditions. Often, you will begin a walk in the morning when the weather is a bit cool and then carry again around lunchtime when the weather was warmer. This carrier allows you to effectively reduce the insulation and allow more airflow to the baby's back, sides, and/or torso. There were several other features we loved about this carrier. First, unlike the ERGO, there is no awkward infant insert to deal with: the carrier is already shaped to support infants as small as 7 pounds without any insert. Second, the carrier configures into 6 different carry positions, which are all really awesome. The first uses the fetal tuck, the second is a tuck with legs out, third and fourth are front- and rear-facing toddler, the fifth is a trendy hip sling style, and sixth is a back carrier for the bigger kiddos (all the way up to 45 pounds!). We found that all 6 positions were highly supportive, well constructed, and very comfortable for both mom (or dad) and baby. A third thing we loved is that it has an adorable sleeping hood, which also is great to protect baby's head a bit from the sun and elements. Fourth, we loved that mom and dad's comfort were taken into consideration throughout: nice wide waist belt, a large lower back/lumbar support pad, super comfortable shoulder straps, all while staying quite lightweight. Fifth, it has some additional little features that are worth mentioning: it comes in a ton of truly stylish and adorable styles, colors, and patterns, it has a convenient zippered pocket on the front for storing little things (phone, credit card, keys), and the carrier itself is adjustable in several ways to both the wearer and baby. In our testing, we also found that it was rather easy to put on and take off (after reading the manual and practicing for about 10 minutes), put a baby in and out, and that it was well-built and reliable. LILLEBaby has made some recent modifications to fix a strap issue, and the resulting carrier is very reliable. Downfalls? Well, not much, but if we are being picky: the storage pocket is on the outside of the zipper-down flap, so it's hard to access when the flap is unzipped. Could have been nice to put the storage pockets on the waistband! Overall, a truly excellent carrier highly deserving of this spot on our list. Usually bout $150, which is an excellent price for this quality, features, and versatility. It's available in a ton of colors and patterns, like 20 of them or something! Interested? You can check out the LILLEBaby Carriers here! 2. Ergobaby 360 All-Position Baby Carrier. This is another all-around awesome baby carrier that has been at this #2 spot for 2 years now. The Ergobaby 360 all-position carrier is the newest addition to the already great Ergobaby carrier line up; a few years ago, their Ergo Original 3-position carrier was rated #1 on our list, so they have a great history of making excellent carriers. 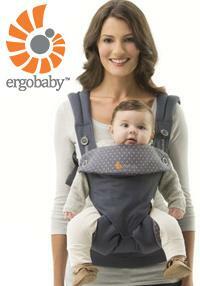 The Ergobaby 4-position carrier is definitely the most comfortable carrier on our list. In our testing, we found it to be super lightweight, comfortable, soft, and easily adjusted to nicely fit nearly any body shape. We wore it for several hours around town and along some trails, and our backs and shoulders felt completely fine. Definitely more comfortable than the LILLEBaby, and we also thought it was a bit easier to breastfeed while wearing the Ergobaby versus the LILLEBaby. We also found it easy to put on, take off, and adjust, even when carrying the baby. However, the shoulder strap adjustment needed to be done by someone else while carrying a baby. It also has a small hood to protect baby from the elements, or give a little shading for a nap. However, it just isn't as versatile as the LILLEBaby. The weight range doesn't go up nearly as high (7-33 pounds), and it requires an infant insert that you have to purchase separately (if your baby is under 12 pounds), and it doesn't have the "bucket" adjustments to accommodate both infants and toddlers thighs. So you end up with the four positions and need to purchase the infant insert to make that 5. We also thought it needed a small storage pouch to carry a paci, keys, phone, etc, and that the Velcro around the waist was great but also quite loud to use. So those are the reasons we chose the LILLEBaby as #1, though honestly, it was a close call. The Ergobaby is just so comfortable for parents and babies, that it was a difficult decision. A truly excellent baby carrier with just some small shortcomings. Usually about $150 and available in a ton of colors and patterns. Note also that the new and pricier Ergobaby Omni 360 is now available and is more similar to the LILLEBaby in versatility, supporting babies and toddlers from 7 to 45 pounds, and offering 6 different carry positions. Some benefits of the Ergobaby Omni are that you do not need a separate infant insert, they got rid of the noisy velcro waist (replacing it with buckles), and has a small storage pocket. But it's also about $180, making it the most expensive baby carrier we've tested. Once we finish a long-term review of the Omni 360, we'll let you know our complete thoughts. Interested in the Ergo 360? You can check out the ErgoBaby carrier here. The BOBA carrier has been in the top 3 of our best baby carrier list for 3 years now, and for some great reasons. It is comfortable, stylish, durable, and very well-made and reliable. The thick waistband tends to support a lot of the baby's weight so your shoulders don't get too sore, with a nice even distribution around the body. We also liked that the waistband has two adjustment points, which helps quite a bit to even out the cinching around the waist. It also has the adjustments for the shoulder straps right under the armpits, helping you customize the fit even when wearing your baby. Some advantages of the BOBA over the Ergo is that it includes an infant insert, supports from 7 pounds all the way up to 45 pounds (like the LILLEBaby), and it has a small zippered pocket along the waist. Though working with an infant insert is a bit awkward relative to having it built in to the system. It also includes little foot straps (stirrups) to support tired hanging legs. Also, we found the range of strap adjustment is very wide, fitting a wider range of body shapes and sizes. So this carrier does, in fact, have a couple advantages over the Ergo. So why is here on the list? Well, in our testing, the majority of moms agreed that the Ergo was simply more comfortable for mom, and seemed a bit more supportive for baby. That's not to say that this isn't a comfortable carrier, because it definitely is. Just not quite as comfy as the Ergo, in our opinion. It also doesn't support a baby facing outward, making it much less versatile than the LILLE Baby or Ergo. In terms of overall quality, the Boba 4G carrier is on par with the Ergo and TULA, they both have high-quality seams and stitching, reliable straps and buckles, and good shoulder padding. We haven't had any issues with rips or tears from any of our top few carriers. Like the others, it comes in a ton of cute colors and patterns, and we tend to see it for around $125 online. Interested? You can check out the Boba Carrier here. This was a new addition to our list for 2018, and we are happy to have tried it out. It's a relatively new baby carrier to the market, and we were really impressed by its quality, comfort, convenience, and versatility. We tried it out with the separate newborn baby booster insert, which is sold separately for about $30. With the insert, it supports babies as little as 7 pounds and up to 15 pounds; when you remove the booster, it can go from 15 pounds all the way up to 45 pounds, which is awesome for backpack-style carrying. Speaking of a backpack, this baby carrier can be used as an inward-facing front carrier, an inward-facing rear "backpack" carrier, or outward-facing "backpack" carrier. There are a few things that make this baby carrier unique relative to its competition. First, it has a good-sized pocket on the front that can fit a small wallet, keys, or even a diaper and a couple wipes. It also has a key loop on the bottom, and some toy loops up on the shoulders - these loops were awesome for attaching a pacifier tether or hanging a fun little toy. Second, the belt and straps are very durable, high quality, and comfortable. They reminded us of the LILLE Baby straps in our testing, they were just that good. All those wide straps make for comfortable carrying that is adjustable and supportive, including the option to wear the shoulder straps in an X-cross design on your back, which helps a ton for heavier babies and longer journeys; crossable straps can really be a life-saver on long treks! Third, this baby carrier can transition to a portable seat for any chair with a back (like at a restaurant or Starbucks), you place baby in, buckle the shoulder straps to the back of the chair, and there is an awesome built-in lower harness. This feature is amazing for toddlers who can sit-up independently and is unique to the Onya carrier. When we tested it out, we also found the seating position to be very comfortable for not just the parents, but also the baby - the thighs were nicely supported and the angle of the legs was comfy. It also has an SPF-protective hood that tucks away out of view when not in use, which is great when it's too sunny or it starts sprinkling outside. Downfalls? Nothing major here. We wish it had an outward-facing front seating position like the Ergo and LILLE Baby, but it only does inward-facing. Outward facing can be done, but only in backpack mode. Also, for shorter babies they tend to sit pretty deep in the seat until they are about a year old, making it hard for them to look around while being carried since the side of the carrier comes up really high. Once they are taller, like 12-15 months, they can start to look around from side to side and see over the carrier fabric. So overall, just some minor issues, overall we think this is an excellent carrier, and worth a shot. Usually can be found for under $150, and there are a ton of cute color options! Interested? You can check out the Onya Baby Carriers here! The Pognae line of baby carriers is super popular in Australia and Europe, and they've received tons of awards for their style, versatility, and overall quality. It's a premium baby carrier that comes at a premium price close to $200. The company itself is based in South Korea and only over the past few years have these hipseat baby carriers been available in Europe and the US. We got our hands on their number 5 version for testing in late 2018. And to be honest, we were super impressed with it! Starting with the basics, it supports babies from 3 months old up to 3 years old, so it's not ideal for newborns but we prefer using a good wrap for newborns anyway. The maximum weight is 44 pounds, which is pretty high for any baby carrier, second only to the LILLEBaby. It claims to have 6 carry positions, which is a little amusing considering 3 of those positions are just the hipseat alone without the rest of the carrier: one where you lay the baby down partially on the hipseat (a good position for feeding), one where the baby is sitting on the hipseat facing outward, and one where the baby is sitting on the hipseat facing inward. In all of those hipseat positions, you're using at least one of your hands to hold the baby given that there is nothing but a little seat on your hip. But if you're looking for a hipseat, you probably realize that already. 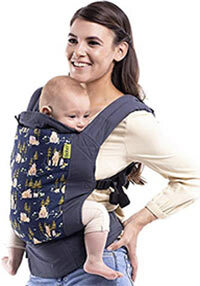 Now for the other 3 positions: one is with the carrier on the front and baby facing outward (like the photo shows), one is with the carrier on the front and facing inward, and the other is with a backpack carrier with the baby facing inward. And when the baby is in one of those three full-carrier positions, they are very nicely supported by the hipseat on their bum. It's a nice seating surface and makes sure that the legs are appropriately positioned for hip development. Here's what we loved. The entire carrier is made with high quality fabrics, materials, and fasteners. The inside fabric is all organic cotton where your baby might be putting his or her mouth against the fabric, so that's a nice touch. The shoulder straps were super wide and comfortable, and the carrier did a great job distributing weight nicely across the hips and shoulders; that's partially because the hipseat puts so much weight on your hips, which is nice for comfort with extended wearing. The hipseat itself is cushioned and mesh for breathability, the zippered storage pocket on the waist is large and great, and it was easy to put on and take off. We found it to be stylish and well-constructed, and easy to clean, just make sure you remove the styrofoam hipseat insert before attempting to wash it! Some other things we liked were the roll-down flap up front for ventilation, the height-adjustable chest strap (for when worn as a backpack carrier, or it can be fastened on the back if you have someone to help you buckle and unbuckle it! ), the big adjustable velcro waist adjustment that also has a large fastener clip, and the fold-down drool flap up front. There were also some things we didn't like. First, the velcro is comfortable for fastening the waistband, but we all know how velcro gets after repeated uses and washings: full of lint and fuzz, and weaker. Second, that velcro was super loud when you are ready to take the carrier off, making a big ripping velcro noise that might wake a sleeping baby. Third, the entire thing is really large and bulky, so it's not the type of carrier you can just throw into one of our best diaper bags when it's not in use. The hip seat is large and filled with a styrofoam block that can't be compressed to help squish the carrier up and squeeze it into a bag. Finally, the price is just too high for us to justify. It's an excellent baby carrier, but we weren't happy that it's priced so much higher than other truly excellent carriers. So there you have it - plenty of great features, comfortable, an awesome option for those looking for a hipseat, but also very expensive and with a few drawbacks. Interested? You can check out the Pognae No 5 Hipseat Baby Carrier here! The TULA series is definitely one of the most adorable, stylish, and trendy baby carriers on the market. It is also quite comfortable, has a simple design, and is lightweight. We liked the front Velcro pocket, though it was a bit difficult to access for moms with shorter arms or larger babies. It can be used from 15 to 45 pounds, giving it a decent upper range but a very restrictive lower range. Basically, you're not going to be able to use this carrier until your infant is a few months old, unless you purchase the separate infant insert. But once you use it, you and your baby will definitely love it! The shoulder straps are highly padded and comfortable, the baby thigh/leg supports are softly padded, the hood is well-sized and removable, and its simplicity makes it quite easy to get on and off. However, while the baby thigh/leg padding is a nice touch, note that that area is not adjustable like it is in our better options, so there will be a sweet spot when your infant fits perfectly, but before then it will be too wide and maybe a bit uncomfortable for baby. After about an hour, several of our test moms did complain of some back pain and wanted to get back into the LILLEBaby with its cross-straps and lumbar support, and outward-facing versatility, or even back to the Ergo. They also noted that it doesn't have very good circulation, and thought it could benefit from some 3D cool air mesh for better airflow. 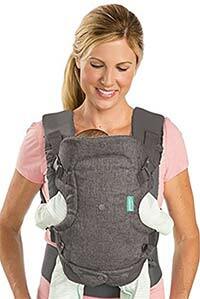 Also, like the BOBA 4G, it does not support an outward-facing position for your baby, only face-to-face carrying. 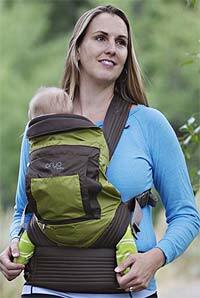 Overall, the TULA ergonomic carriers are great but have some basic limitations. For the price, we were expecting it to be a real winner, and walked away thinking it's great, but not quite as great as the others above it. It is available in a ton of truly beautiful colors and patterns, putting many of the other carriers to shame! Tends to sell for under $100 online, making it one of the best deals on a premium baby carrier. Interested? You can check out the TULA Baby Carrier here. The Original BabyBjorn carrier is a classic and really started the style revolution for soft carriers. Suddenly it was stylish to wear a baby carrier, and it was no longer giant, bulky, and utilitarian like the baby carriers your mom might have stuffed you into back in the 80's. The BabyBjorn carrier still remains a staple in the soft baby carrier market, and the price of the Original version has fallen considerably since its introduction. The BabyBjorn Original model is very basic - shoulder straps only, not much adjusting, and no-frills (no newborn insert, no waist strap, no pocket, no hood, etc). It's a good carrier but will make for sore shoulders and neck after about an hour of use. Because of these complaints, and because the market was getting taken over by more versatile and comfortable carriers, Baby Bjorn decided to come out with their own version of a larger, more padded, and more versatile carrier. The One carrier is just like the Comfort model from earlier years and has a lot of the basic capabilities of our top rated carriers: front-facing option, waist strap to relieve shoulder pain, multiple adjustments, soft padding, etc. But there is no newborn insert (8 pounds minimum baby weight), no storage pocket, no sleeping/sun hood, and is much bulkier and harder to store relative to the Boba and Ergo. Also, in our trials, we found that the BabyBjorn One doesn't quite take the weight off the shoulders like the Boba or Ergo. In contrast, this Baby Bjorn carrier has a couple decades of great refinement and innovation behind it, including great ratings of comfort and safety, so keep that in mind. So if you're looking for a relatively simple, stylish, well-built and reliable baby carrier for under $50 or so, the BabyBjorn Original baby carriers are probably a great option for you! Interested? You can check out the BabyBjorn Carrier Original version here! Style, versatility, quality, and a fantastic price? Get us two of them! The Infantino Flip 4-in-1 baby carrier is a fantastic inexpensive baby carrier with some great features and simple but trendy styling. Supporting babies from 8 up to 32 pounds, this baby carrier can be worn in 4 ways: facing-in for infants with the seat flaps buttoned back to support a narrow baby, facing-in with a wider seat for older babies (using the seat flaps), facing-out for babies with head/neck control, and back-carry for older babies. So technically it supports facing-in and facing-out as a front carrier and can be used as a backpack baby carrier. For under about $30 that's excellent versatility. It achieves the wider baby weight range by having an adjustable seat width by opening or closing two thigh flaps on each side of the bum and having adjustable leg and chest openings. For the parents, it also includes adjustable shoulder straps and waist belt, keeping things more comfortable and supportive for various body types (speaking of which, the waist belt adjusts from 24-47"). So it can fit skinnier moms, and also plus-sized moms up to about 250 pounds. In our testing, we found the carrier to be very lightweight, breathable, and generally reliable with moderate quality buckles and adjustments. We also loved that you can throw the entire thing into the washing machine, and it didn't shrink at all on us. The shoulder straps were OK - not anywhere as nice or comfortable as the top baby carriers on this list, but reasonably padded. Carrying a baby over 15 pounds for a couple hours and you will probably find yourself in some back and shoulder pain, unlike with the LILLEBaby or Ergo carriers. The Infantino Flip Advanced baby carrier does include a drool pad with a velcro attachment, which we found of limited value: it works best for facing-out, but also tends to fall off and can be easily removed by a baby. It's a decent idea but poorly executed. So overall, just a few limitations: comfort, support, versatility for little babies (under 8 pounds), no hood/cover, and the silly drool pad. But did we mention how cheap this baby carrier is!? Under 30 bucks! That's cheap, and this thing is surprisingly great for that price! One of our favorite all-time carriers under $50, with features and versatility that are quite good for this price range. Supporting babies from 12 to 33 pounds, this carrier does not have an infant insert and can only support babies after they are a few months old. It can be used rear-facing on the chest and on the back but doesn't work as a front-facing carrier which is unfortunate. But that's where the limitations end. It has nicely padded shoulder straps that we thought were quite comfortable, and it does have a small strap to connect the two shoulder straps and help keep things in a nice comfy position for mom and dad. It has a removable hood, and more pockets than most other carriers on this list, with four zippered pockets, some on the carrier itself, and some around the waistband. Speaking of the waistband, it is quite wide and thick for this price range, and uses Velcro in addition to a clip, keeping it secure. In our testing, we thought the fabric was impressively soft and durable for a carrier in this price range. It also comes with some drool pads that you can remove and wash separately. Overall, this is a really great carrier for this price range, though like the others it's not appropriate for babies under about 12 pounds, and has limited versatility in terms of carrying positions. Tends to sell for about $50. This is a great back-to-basics soft-structured carrier with some great versatility, especially given the price point. There are 3 carry options: rear-facing front, hip sling carry, and front-facing back. Notice how there is no forward-facing front position and no infant position. Not only is there no infant (fetal tuck) position, the carrier is not suggested for use under 12 pounds. It does go up to 36 pounds, however, which is quite good. There are also some good additional features, like a zip-down flap to expose some cool air mesh for higher breathability, much like the LILLEBaby. Also has storage pockets and a hood. Downfalls? Well, not anywhere near as comfy or padded as our premium options, and the cloth is nowhere near as soft and luxurious. Also cannot support infants, and has no infant insert. Overall, a great option if you're looking to save a ton and can deal with the limitations. Tends to go for about $35 online. This is one of the more unique carriers on this list, and we think it's great for older toddlers and bigger kids (up to 45 pounds). What's really unique is that this carrier can be used as a forward-facing carrier, a rear-facing carrier, and also as a super cool hip-seat for older babies. What is a hip-seat? Well, it's not a baby carrier at all, but rather a little seat you have around your waist to help support your baby's weight. It's a great concept to reduce those sore arms from carrying your baby around in the natural position. And the carrier is quite good as well. It uses lightweight highly breathable fabric and design. It's basically the hip-seat with an added back support to turn it into a very simplistic carrier. It does have some nice features, however, especially for the price point. It has three small mesh pockets (non-closing) that can fit a phone, keys, pacifier, etc. It also has a nice wide waistband which helps with comfort and stability, especially when using the hip-seat. It uses Velcro and a buckle to hold on the waist, which makes it feel quite secure. But there's no infant insert and can only be used for babies over 12 pounds. No closing pockets, nowhere near as padded, soft, or luxurious as our top options, and definitely not as comfortable to wear. But if you're looking for an inexpensive hip-seat that doubles as a basic carrier, then this could be the option for you! Usually about $50 online. Infantino makes a wide range of baby products and several varieties of baby carriers. They have over a dozen options, some of which are difficult to tell apart from others, and some are not really worth considering. We will say that we're impressed by the pricing and features of the Infantino line, with an overall reliable and secure set of carriers at great prices. As with all the others on this list under $50, it has limited weight range, versatility, and comfort. The Cuddle Up is included in this list for a few reasons. First of all, it is adorable, with a cute bear hood cover that goes on like a soft hoodie cap and has cute little ears. When it's off, it has a cute colored chevron pattern on the fuzzy inside. 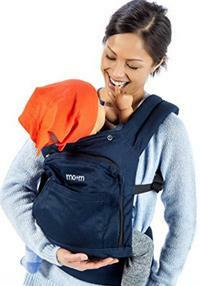 It's the only carrier on this list that has a hood that can actually keep your baby's head a little warm in the fall. Second and continuing the hoodie theme, it also includes a front pocket just like your favorite hoodie, though we point out that things can fall out of it at times, particularly when taking the baby in/out or taking the carrier off. Third, we found the pads to be reasonably supportive and the adjustments were sufficient. Not too much back or shoulder pain. Note that like the Mother Nest and Mo+m carriers, it only supports two carry positions, both are facing mom or dad: front carry and back carry. It also only supports from 12 to 40 pounds, which is par for course on this inexpensive carrier list. Usually about $40 online. For full details about how to choose a baby carrier, check out our new baby carrier buying guide! Babies love being held close to mom or dad, feeling the warm comfort of their chest and the gentle rhythm of their breathing and heartbeat. But unless you're Ronda Rousey or Mark Wahlberg, your arms and shoulders are going to get very tired from lugging around a growing baby all day. That's where baby wraps and slings (see our best wrap baby carriers and slings here), and soft-structured baby carriers come in! 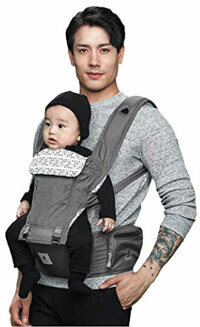 Each year, there are several new entrants into the baby carrier market, like the Baby Ktan and several random Chinese brands that saturate eBay and Amazon, making it harder to make an informed decision about which ones are best for you and your baby. Now that we've mentioned Baby Ktan, while we don't include their carrier in this list, you can find our review of the Baby Ktan Original and Breeze carriers in our baby wraps article. Ergonomics. To ensure proper hip and back development, the ergonomics of a baby carrier are very important. There are a few things to look for here. First, you want your newborn infant (first couple months) to adopt the C spinal alignment, which means there is a nice curvature to your baby's back, with legs tucked up. This is called the "fetal tuck" position, and it reduces pressure on the spine and hips, promoting calmness and easier digestion. Second, you want your infant (3+ months) baby's buttocks and hamstrings to be supported, putting the baby into a "frog leg" position. In other words, you never want the legs to be dangling down below the carrier (just from the calves down), and this is true for at least the first couple years of life. When testing out the carriers, we looked for the fetal tuck for newborns, and a maintained frog leg position for infants, toddlers, and bigger kids. Of course, we also need to think about ergonomics for mom and dad, not just for baby. As your baby gets heavier, you will realize that ergonomics will become increasingly important to maintain back, shoulder, neck, and hip comfort. The great carriers have criss-crossing shoulder straps that serve to more evenly distribute weight, and big wide waist belts to help take some weight off of your shoulders. The Lillebaby's Complete series is a great example of that. This is essential for wearing the baby on your front, or on the rear as a baby backpack. Note that one common issue is compatibility between diaper bags and baby carriers: when you're baby-wearing, it's cumbersome to also carry a diaper bag. Some of the best carriers have storage pockets that can fit some baby essentials, like a diaper and wipes, a pacifier, and maybe some other small baby gear items. Safety & Reliability. There is no more important factor to consider than safety. There are a lot of factors to consider here. How is the stitching along the important seams, and where the buckles and zippers attach? What is the quality of the zippers? What is the quality of the clips, fasteners, adjustment slides and loops, and Velcro? How do these components stand the test of time, with repeated wearing and adjustment? Many carriers use lower quality connectors, fabrics, and stitching, and don't do well with repeated wearing. The last thing you want is a malfunction of a weight-bearing component. Safety also considers the baby position, the breathability of the fabric, and the appropriate head and neck support. Our testing considered short-term hands-on use, and reviews from long-term use, pulling together a wide range of data regarding these safety considerations. Note that we do not include any ring sling style carriers on our list, given the safety concerns with these carriers. Specifically, while ring slings can be very comfortable and safe baby carriers, there have been some cases of misuse and negligence. That doesn't mean that you can't use a ring sling, just that you need to be more careful. Here's a good article from Mayo Clinic summarizing that point.